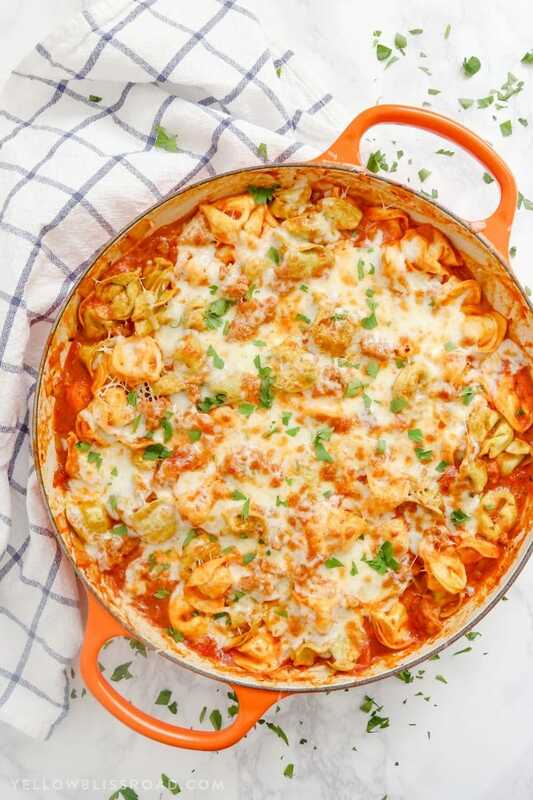 This Italian Sausage & Tortellini Skillet is a quick and delicious meal that cooks all in one pan using just five ingredients. It’s an easy weeknight meal that you’re entire family will be begging you to make over and over again! We love Italian Sausage recipes because they pack a to of flavor into a single meal, like Spicy Italian Sausage Dip, Tortellini Soup or Italian Sausage Meatballs. 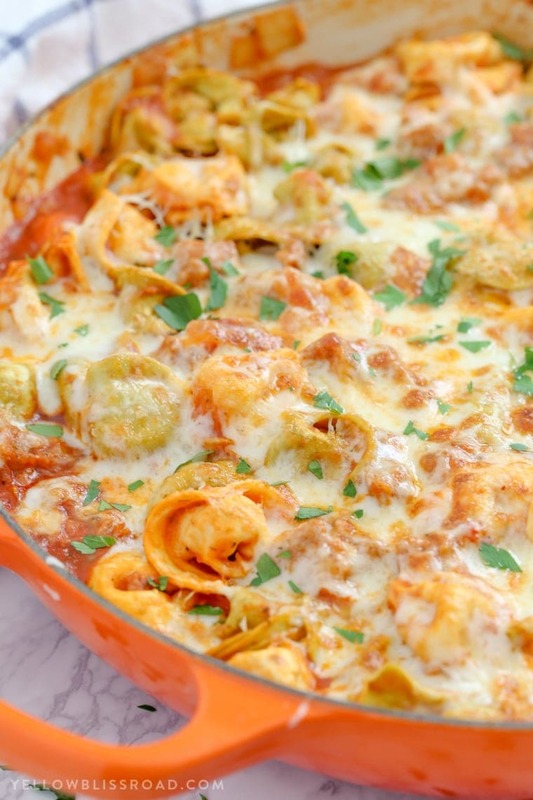 This Italian Sausage & Tortellini Skillet is no exception! One Pan Meals are the kind of dinners you need in your weeknight recipe arsenal. They are quick, they are easy, and if you’re grabbing them from my site, I can guarantee they’re delicious! 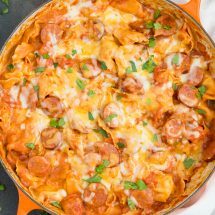 This Italian Sausage & Tortellini Skillet Recipe is a family favorite and is something my kids cheer for. It’s a blog favorite too, clinching one of the top spots for the past three years with nearly 1 million annual views. It had been ages since I’ve made this dish so I decided it was time for a reboot. Use fresh tortellini – I have found the refrigerated tortellini to be the freshest. The recipe calls for 20 ounces of refrigerated tortellini. I typically will pick up the 2-packs at Costco and one of those is the perfect size. Buitoni also makes a refrigerated tortellini in the 20 ounce package which you can see HERE. (affiliate link) If you can’t find the 20 ounce package, just substitute two of the 9 ounce packages and you’ll be fine. 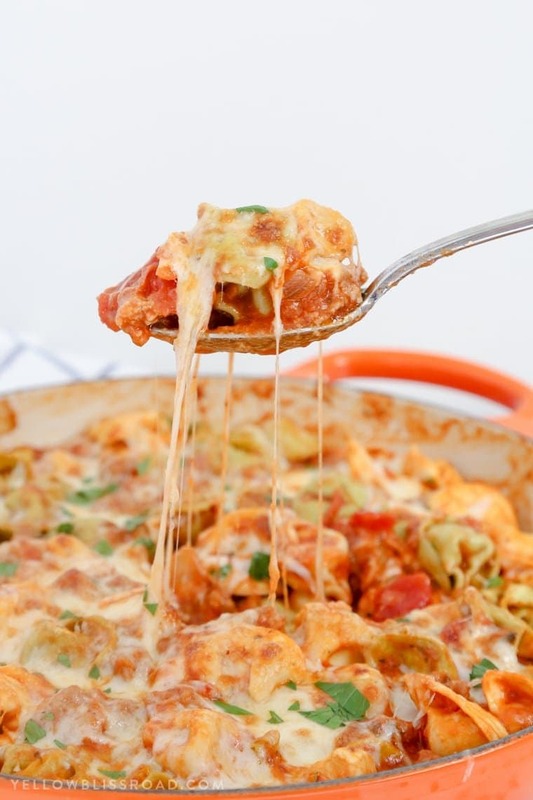 Cheese tortellini is best – My personal favorite is the five cheese from Costco, but you can use any flavor of tortellini that you like. Meat filled tends to have a different flavor though that doesn’t pair as well with the Italian Sausage in this recipe. This time around I didn’t make many changes, other than to add some onion and garlic, which I think are totally optional. They really do add another depth of flavor but do add about 10 minutes to the prep and cooking time. It’s a personal preference – you can easily omit those two ingredients, but I recommend using them as the flavor and the aroma can’t be beat. Can I use Frozen Tortellini? A lot of comments I get ask about the type of tortellini. I have only used refrigerated tortellini with this recipe. However, a lot of readers have shared that they used frozen and it turned out beautifully. You’ll just need to adjust the cooking time slightly, and the frozen may result in more liquid, so be mindful of that. 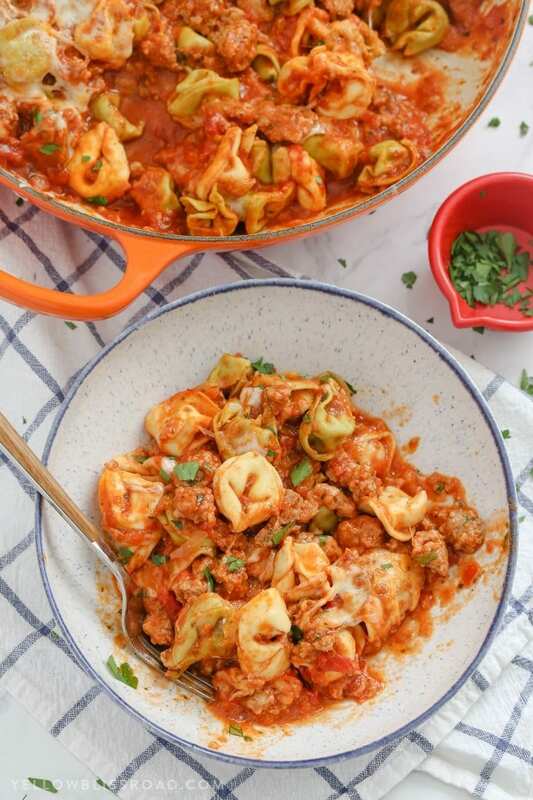 My Italian Sausage and Tortellini Skillet is easy, it’s delicious and it’s a quick meal to get on the table when you’re in a hurry. With a quick prep of just 5-10 minutes, and a cook time of just 15 minutes, you’ll have dinner on the table in no time. The tortellini is tender and flavorful, with an extra boost from being cooked right in the sauce. The sausage give a nice savory salty, or even spicy bite that compliments the creamy cheese. The leftovers are amazing, too! Start by cooking Italian Sausage with onions and garlic until the sausage is no longer pink. Use a wooden spoon to crumble the sausage as it cooks. Drain any extra grease from the skillet and return the sausage to the pan. 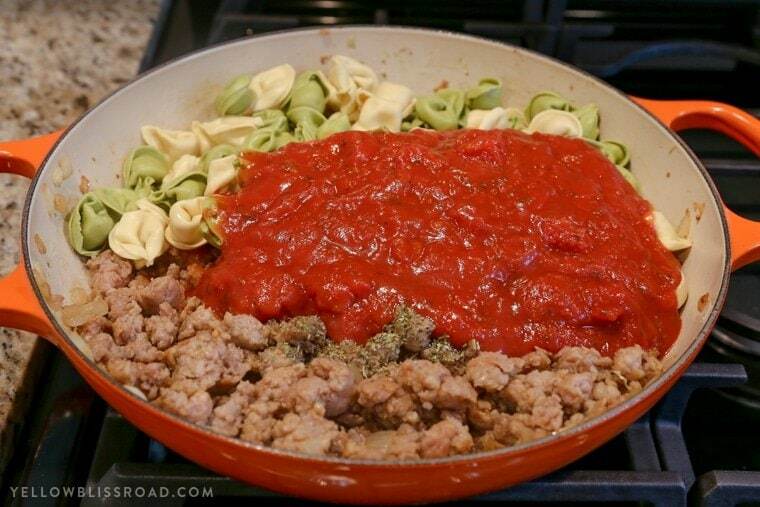 Add spaghetti sauce, water, seasonings and tortellini to the pan and bring to a simmer, stirring often. Reduce the heat, cover the pan and cook for 7-8 minutes or until the pasta is tender. Remove the skillet from the heat source and sprinkle with Mozzarella and Parmesan cheeses. There are two methods for melting the cheese, but my favorite is under the broiler where you get those lovely crunchy brown bits as the mozzarella broils. Garnish with fresh parsley or basil and serve immediately! 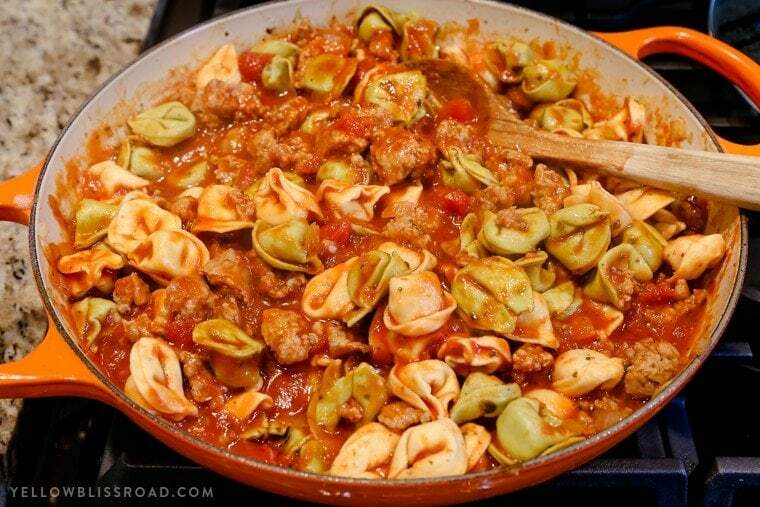 This Italian Sausage & Tortellini Skillet is a delicious and simple one pan meal. It's an easy Italian Sausage recipe that you're entire family will love! Heat an oven safe skillet over medium-high heat. Melt 1 tablespoon olive oil and add onions, cooking for a couple of minutes or until they begin to soften. Stir in minced garlic and add crumbled italian sausage. Cook until no longer pink. Drain off any extra grease. Stir in spaghetti sauce, water, Italian seasoning and Tortellini. Bring to a boil, stirring occasionally, then cover and reduce heat to low. Simmer for about 8 minutes, or until tortellini is tender. Remove from heat. 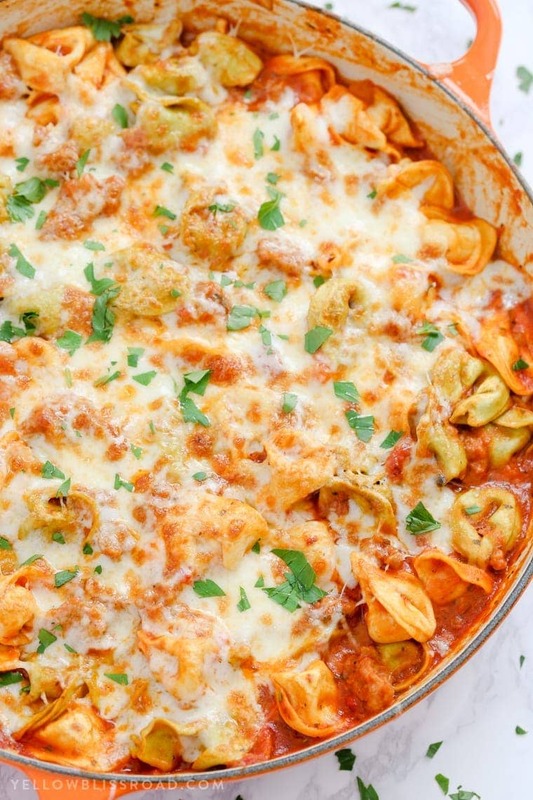 Sprinkle Mozzarella can Parmesan cheeses evenly over tortellini. Cover the skillet with the lid and let sit for 5 minutes while the cheeses melt. Alternatively, you could place the skillet under the broiler for a 2-3 minutes or until golden, melted and bubbly. Garnish with fresh chopped parsley or basil if desired. This is delicious! It’s definitely easy and delicious! And cheesy! I love cheese! I used dried cheese tortellini and it still worked out well! I used 1- 1.5 c of water and boiled for about 13 minutes. Thank you Amy! and thanks for sharing your experience! It will feed 4-6 depending on portion size. Made this tonight. It was delicious! My very picky 11 year old even asked for seconds. Will definitely be adding this to our rotation. This was amazing! I cooked the sausage first and used an iron skillet, which caused some of the sausage to stick to the bottom and get really crispy. I took out the sausage and cooked some onions and garlic, when it was almost done I put in the seasonings, that helps bloom the spices. Then I used chicken broth instead of water and I needed way more than 1/2 cup, which is fine by me. The end result was amazing! I will definitely be making this again! Just made this tonight. So quick, easy and delicious!!! Thank you for this recipe…can’t wait to make it again!! !